Choosing effective insulation today is an important decision which will make a considerable difference to your comfort and to the durability of your property. The purpose of insulation is to create a barrier against the transmission of cold or heat through walls, floors or roofs. Energy savings: Effective insulation can reduce the energy consumption of buildings by up to 60%. Preservation of environment: through the emission of fewer greenhouse gases. Improved comfort all year round: cooler in summer and warmer in winter. Increase of the value of your property both for leasing and sale. Where should insulation be applied? As with a sieve, it is pointless to plug 80% of the holes if everything can escape through the remaining 20%. The idea is identical for a house. 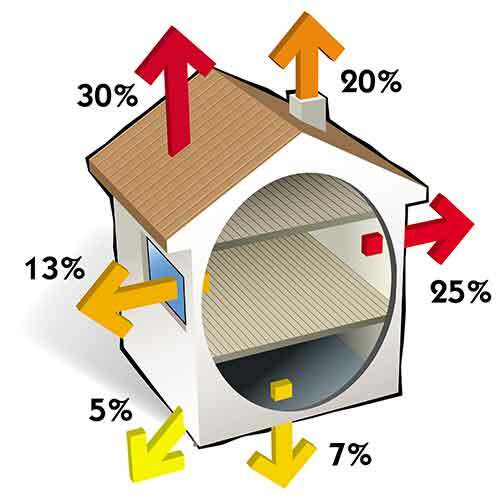 It is better to fit a moderate amount of insulation everywhere than a lot in one place. Walls and ceilings don’t have the same heat loss characteristics. As hot air is lighter than cold air, it rises as cold air descends (convection). The roof is therefore the surface which is most exposed to the risks of heat loss. It is important to use airtight insulation, above all in old buildings whose walls are often air permeable. to preserve the durability of buildings and in so doing, enhance the longevity of properties. Heat transfer always occurs from a hot zone to a cold zone. Heat transfer only occurs when there is a temperature difference. Heat transfer can be represented physically by a thermal flux. Because the temperature inside the building is higher than the temperature outside, the heat produced by the heating system tends to escape outside: this is known as heat loss. The purpose of insulation is to reduce that heat loss. In full sunlight, roof tile temperature can reach 60°C and roof slate temperature can rise to 90°C. The roof covering emits a considerable amount of thermal radiation towards the inside of the dwelling, which has an adverse effect on the thermal comfort of its occupants. The purpose of insulation is to block the passage of this radiant heat. ACTIS multifoil reflective insulation is made up of multi-layered reflective films, only a few microns thick. These layers, which are separated by wadding, foam, sheep’s wool etc. are sewn together to form a thin insulating blanket. Reflective multifoil insulation is an airtight multi-layered product composed of a series of reflective films interspersed with separators such as wadding and foam. All the layers put together act as an insulating blanket. These products are typically installed as a continuous layer across structural members (e.g. ACTIS Boost’R Hybrid and HControl Hybrid). How does reflective insulation act against heat loss? Generally, reflective insulation reduces heat transfer by counteracting all modes of heat transfer (radiation, convection, conduction…). They are particularly efficient at limiting thermal transfer by radiation. Films have usually a high vapour resistance and are reflective. In the case of multifoil blanket insulation, each internal reflective foil of a multifoil insulation acts as an additional barrier to thermal transfer by radiation. ACTIS insulation products are water tight.